One of the most spectacular ways to serve pasta is al cartoccio -- boiled, sauced, then wrapped in parchment paper (or aluminum foil) and baked. This might sound like an odd preparation method, but your guests will greet the arrival of the packets at the table with mounting anticipation that will turn to joy as they open them. 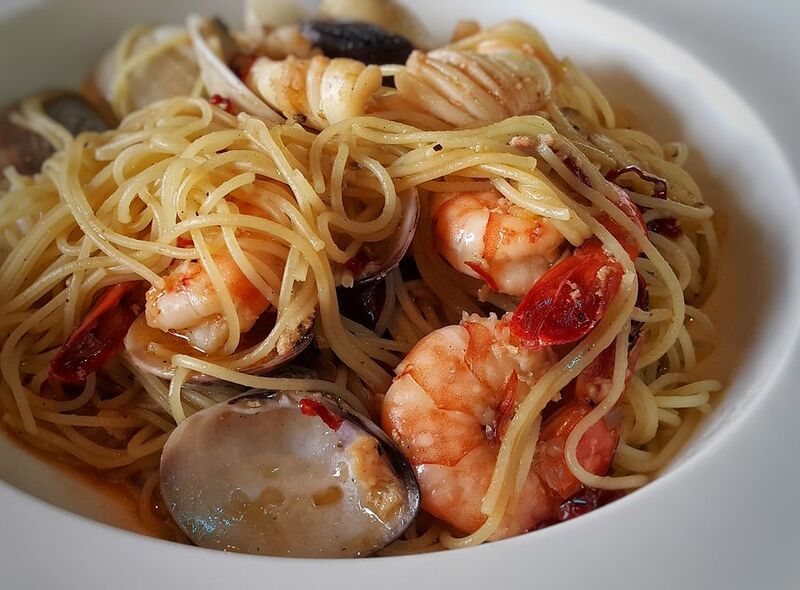 This traditional Italian recipe calls for a variety of shellfish, many of which are strictly Mediterranean and difficult to find outside of that area. This updated version omits the more obscure shellfish. If the shells of the shellfish (clams, etc.) are pretty, scrub them very well before you begin making the sauce, and don't shuck them after they have opened: Put them -- shells and all -- in the cartoccio and they'll add a special touch to the finished dish. Wash all the shellfish very well. Set a pot with 3 quarts of lightly salted water to boil over high heat. In the meantime, pour the olive oil into a large skillet and add the garlic, the chile pepper, and the seafood. Cook over a low flame for 5 minutes, then add the chopped tomatoes, basil, and parsley. Simmer for 15 minutes. Preheat your oven to 450 F (250 C). Keep an eye on the pasta pot as the sauce simmers, and when the water boils add the pasta. Let it cook until half done (usually about 4 minutes), then drain it well in a colander and transfer it while it is still dripping to the skillet with the sauce. Toss the pasta-and-sauce mixture by moving the skillet as you would if you were flipping an omelet. Roll out a long sheet of aluminum foil or parchment paper and fold up the sides to make a box-like container. Transfer the pasta to the container, fold the aluminum foil or paper over it, and crimp the edges together to make a sealed pouch (you can also make individual pouches for your guests if you wish). Bake in the oven for 5 minutes, at which point the pouch will have puffed up. Slide it onto a serving dish and open it at the table.